A Nashville songwriting tradition for 15 years, "Tunesmithing" spotlights professional and emerging songwriters. The event occurs in Nashville from 7-9:30 p.m. the third Saturday of each month. Want to perform? Feel free to write us here or at info@Tunesmithing.com. We will also use this blog to provide helpful information for songwriters. Learn about more career-changing opportunities and artist news at www.MusicCityArtsUpdate.com and www.MusicCityArts.net . 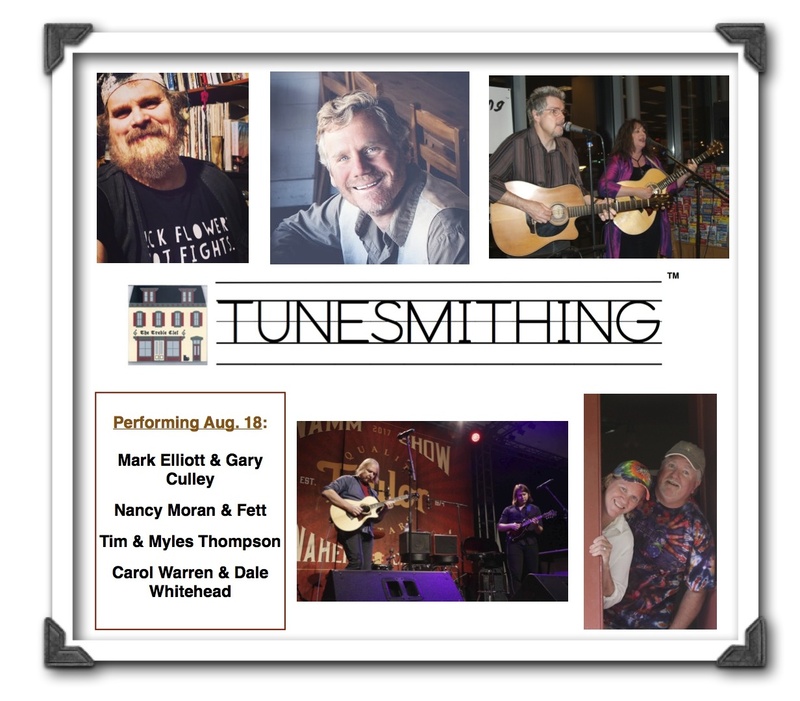 NASHVILLE, Tenn. (August 2018) -- Four Nashville songwriting duos will take the stage on Aug. 18 (Saturday) at "Tunesmithing," a monthly songwriters show at WXYZ Restaurant/Bar at the Aloft Nashville West End Hotel, 1719 West End Ave.
Attendees will enjoy original songs and instrumentals by Mark Elliott & Gary Culley, Nancy Moran & Fett, Tim & Myles Thompson, and Carol Warren & Dale Whitehead. Admission is free. Food and beverages will be available for purchase. Nashville composer-educator-publicist Chuck Whiting will emcee the show. Songwriter/audio engineer AJ Bigler will handle sound. "Tunesmithing" songwriters showcase is sponsored by Music City Arts Network, Striking Moon Music, and Shine Time Music. The monthly show was founded in 2003 to spotlight emerging, professional and hit songwriters, as well as artists of all kinds. The event offers mentoring, career growth and networking opportunities for artists at all levels. For more information about "Tunesmithing", call (615) 423-9857, write Info@MusicCityArts.net, or visit http://www.Tunesmithing.com. Chuck Whiting is an award-winning educator, songwriter/composer, publicist and author. A former newspaper reporter, he founded Music City Arts Network in 1993. His clients include songwriters, musical performers, authors, visual artists, art galleries, hotels, non-profit organizations, and businesses of all kinds. He began his career as a newspaper reporter for The Birmingham (Ala.) News and The Mobile (Ala.) Press Register. After that, he served as a PR representative for Gaylord Entertainment, handling projects for the Grand Ole Opry House, General Jackson Showboat, and Opryland Hotel. His entertainment media firm Music City Arts Network celebrated its 20th year of operation in 2013. Shine Time Records and Books, the book and music publishing arm of Whiting Publicity, provides promotional and logistical support for authors and performing artists of all kinds. Chuck is the co-author of The Littlest Star: a musical story, a book and CD featuring performances by musical performers Margo Smith, Denny Jiosa and Conni Ellisor. Music City Song Library features instrumentals and songs penned by Nashville artists.